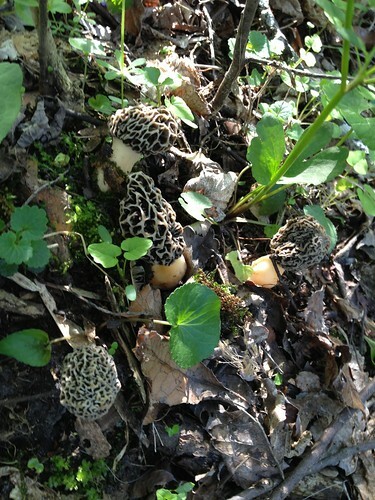 First finds of 2012 – Morels are a month early! 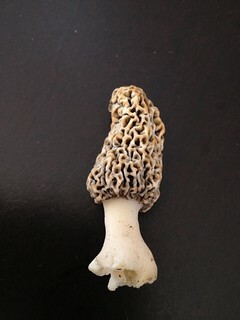 The first mushroom of the season was this morel, found on 4/6/12. It’s been the strangest spring. Temperatures here in northern IL soared into the 80’s for weeks in March, and the resident vegetation responded with enthusiasm. Everything started to bloom – dogwoods, forsythia, lilacs, red buds, crab apples, daffodils, hyacinths and even some tulips. By April first, the landscape was green and lush. It looked like mid-May. Doubting, but hopeful, I looked around. And found nothing. Despite all the greenery, the fungi were still holed up. Initially, I didn’t even see any pheasant backs, and those are seriously fruitful in my area. Then the weather took a cooler turn, returning to more normal temperatures, which are generally speaking a bit too cool for morels. Some of our Friday finds, pre-picking. A friend’s boyfriend has been finding morels down in southern IL, where he has a cabin, and he even brought me a sample (which were delicious!). However, Illinois is a big state, and the climates at the opposite ends are very different. 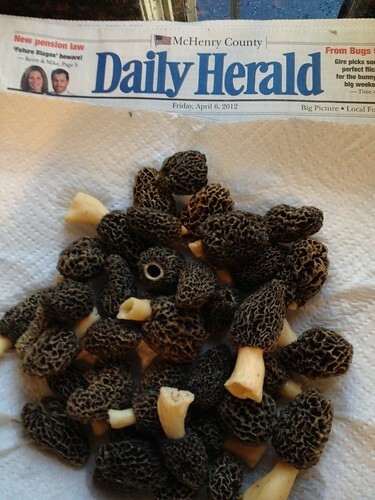 However, on Thursday, when he sent word via my friend that his son found morels in Elgin IL, I sprung into action. Elgin is pretty close by! My mom is visiting us for Easter, and she loves morels. I was hoping to Fedex her a shipment last year but I failed to find enough to make it worthwhile. With the news of the finds in Elgin, however, I made plans to go hunt in some areas where I knew she’d be able to get around safely. She arrived on Friday afternoon buzzing with news from the Iowa radiowaves – some lucky soul had found 500lbs of morels near Des Monies. When I told her we were going out to look for some that very day, she was very excited, though I did have to manage her expectations. The first place we visited – a newly cleared wooded lot near a school, immediately yielded one morel (pictured above) and a lot of hope. The second location was a total dud. The third, however, was not! If you’re into morel hunting, you know the feeling when you find a nice patch. First one, then another, then – oh look! here are three – and then a few more. It’s a thrilling feeling! We gathered about two dozen nice, fresh yellow morels. We took our finds home, swished them around in salted water and then gently spun them dry in a salad spinner. We then sliced them in half, and sauteed them in butter, enjoying them straight from the pan, and gracing the top of an asparagus risotto. These gorgeous, buttery, nutty mushrooms were fantastic with the accompanying chardonnay from Hartford Court in Sonoma. It was the perfect end to a wonderful day! 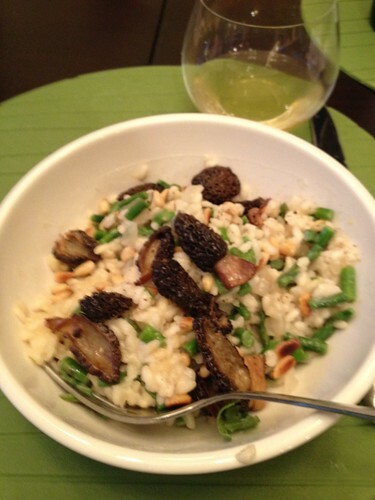 Sauteed morels atop an asparagus risotto. This entry was posted in edible wild mushrooms and tagged morels. Bookmark the permalink. It’s April 22. What’s you new mushroom news? I’ve found a few more, but it’s been chilly. I’m hoping for a second flush when the weather warms up next week!